LargeFriends is a friendship and dating community for men and women of above average size. Run by the Successful Match group, LargeFriends offers a convenient and safe online venue and is well suited to those seeking friendship and support or finding a new romantic partner. The site has been around for years, is a welcoming and engaging community of people of all ages. Overweight singles and their admirers can use it to find dates and make friends. Forums are a great place to seek advice, ask questions and to find out about events. You can join up in a matter of minutes by going to the registration page, and entering some basic details about yourself. It prompts for an email and telephone number, but only an email is required. You're then taken straight inside. The rest of your profile can be filled in later. You start as a guest or Standard member. As a Standard member you're allowed limited browsing and the ability to read emails only if sent by someone who's already subscribed. Upgrading to a Gold membership gives you full access to email and chat privileges plus enhanced search functions and the option to use the site's compatibility matching systems. Full membership also lets you do reverse matches, and search for users by their username. As well, it lists paid members at the top of search pages. This of course makes it very difficult to get to know people as a guest because you have to wait to be contacted first. Though if someone takes your fancy you can prod them with a quick flirt. This isn't a big community by any means. Filling in your personal profile is especially important because it will help you to get the best out of the experience. Like most dating sites, LargeFriends can only match you with other people based on what you tell them. From the edits page of your profile you can enter just about any fact about yourself, as well as hobbies, interests, your lifestyle, appearance and so on. There is also a form for outlining characteristics or traits one is seeking in their prospective matches. Photos can be uploaded and can be marked as either private or public. Public photos appear in their search pages, but for private photos you have to grant the other person permission before they can view them. You'll have the choice whether to have your photos verified or not. Not surprisingly, Gold members have extended options for searching, communicating, sending emails and interest (winks). They also gain access to the site's 24x7 help and support. As a standard member you can read messages but cannot initiate contact other than with flirts and winks. Using the zip code or area locator can mean finding potential matches close by or internationally. The reverse match tells you who is looking for someone with your qualities. This feature is great at bringing up people you might not have spotted before or who might not have noticed you. Anyone can view who is online and who has been viewing their profile. Under My Lists you can find pages that will tell you who's viewed your profile, who likes you and who has added you as a favorite. You might want to strike up conversation with some of these people if you haven't already. LargeFriends' range of features allow you to make quick contact with other people there. The forums make for a close knit atmosphere and community. If you are larger than average or will accept someone for their size and love them for it, it could be worth a look. The forums are reasonably active and are a great place to seek advice, ask questions and to find out about events both online and off. The moderators also work hard to keep the content clean and free of spam - this enhances the safety of all members. Largefriends is a suitable place for you if you are larger than average or will accept someone for their size and love them for it. This isn't a big community by any means. There's only about 26,000 active members there. But it is active enough such that makes the site a worthwhile prospect. Apps are available for both iTunes and the app store. Rss Feeds. Subscribe to comments for this site. [?] Receive updates about Largefriends.com directly through your newsreader. LargeFriends 3.45 3 A review of LargeFriends. 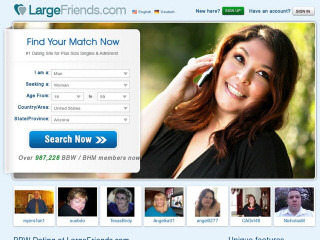 LargeFriends is a friendship and dating community for men and women of above average size.